Each one of our Premium Giovanni Spa Sets comes with one unisex waffle spa robe, a matching pair of slippers, and a 3-piece towel set, five items in total! Everything you need for a day at the spa, in the comfort of your own home. The unisex spa robe is designed to comfortably fit men and women alike and is one size fits most. It measures 53 inches long with a horizontal sweep of 63 inches. The sleeves measure 13 inches. Each robe is made from the finest Egyptian cotton and woven into a comfortable waffle weave, designed for maximum absorbency. Machine wash and dry for quick and convenient care. The three piece towel set is also made from high quality Egyptian cotton. Thirsty and absorbent, these towels are perfect for drying off before slipping into your new robe. The three piece set includes one wash cloth (13" x 13"), one hand towel (18" x 28") and one bath towel (30" x 54"), all generously sized so you can fully immerse yourself in comfort. Machine wash and dry for quick and convenient care. The spa slippers are crafted from a waffle weave material and perfectly compliment the robe. They also feature a non-skid sole so you won't have to worry about slipping after your shower, and extra foam lining for extra comfort. The slippers are one size and designed to fit both men and women. Spot clean only. WHAT'S INCLUDED - Everything you need for a day at the spa, in the comfort of your own home! 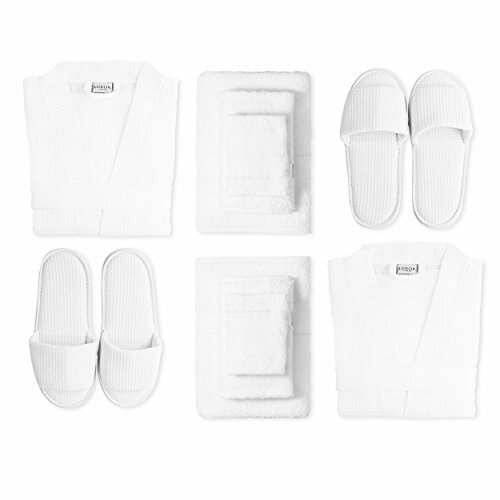 Each one of our Premium Giovanni Spa Sets comes with one unisex Waffle Spa Bathrobe, a matching pair of Slippers, and a 3-Piece Towel Set, five items in total! BATHROBE - The unisex spa robe is designed to comfortably fit men and women alike and is one size fits most. It measures 53 inches long with a horizontal sweep of 63 inches. The sleeves measure 13 inches. Each robe is designed for maximum absorbency, made from the finest Egyptian cotton and woven into a comfortable waffle weave. Machine wash and dry for quick and convenient care. LUXURIOUS SLIPPERS - The spa slippers perfectly compliment the robe, crafted from a waffle -weave material. They also feature a non-skid sole so you won't have to worry about slipping after your shower, and extra foam lining for added comfort. The slippers are one size and designed to fit both men and women. Spot Clean Only. PREMIUM TOWEL SET - The three piece towel set is thirsty and absorbent, perfect for drying off before slipping into your new robe, made from high quality Egyptian cotton. (1) Washcloth measures 13" x 13", (1) Hand Towel measure 18" x 28" and the (1) Bath Towel measure 30" x 54" - All Generously Sized so you can fully immerse yourself in comfort. Machine wash and dry for quick and convenient care. CHOOSE INCREDIBLE COMFORT - Click the "Add to Cart" button above to enjoy your cozy new Luxor Linens Bathrobe, Slippers & Towel Set!